IP Phone Pager from CI helps customers get the most out of their Avaya IP Phones. IP Pager allows Avaya customers to take advantage of their IP Telephone network to broadcast messages to Avaya IP Phones and overhead IP Speakers from CyberData. With the tools provided in the browser-based IP Pager GUI, creating and modifying virtually unlimited pager groups, zones and recipients is quick and easy through the "point and click" interface. When you need to get the word out fast, paging is an industry standard. Traditional paging systems require additional wiring and have point of presence location issues. Today we can take advantage of IP networks, IP Phones and IP Speakers to get the word out to virtually any location. IP Pager also provides the foundation to	"push" screens to the Avaya IP Phones for custom application development. This	allows customers to get more functionality and value from their IP Phones. You now have one more way to "reach out and touch" your fellow co-workers. CI's IP Phone Pager allows internal paging communication by voice or text messaging via your LAN and Avaya IP Phones. Any authorized extension can securely initiate a voice page to be delivered to an individual or a designated group of recipients. An easy to use, web-based interface, provides text message push, alert tones, silent page, barge-in and test to speech (TTS) broadcast ot typed messages.. 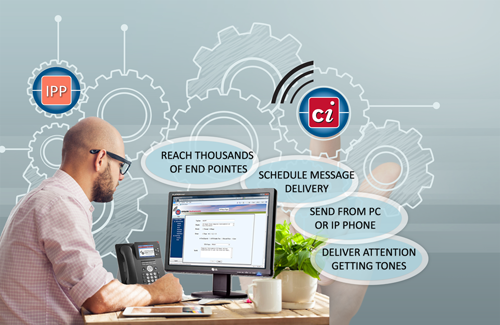 Contact CI today to see for yourself how IP Phone Pager can help you Implement Network Paging, Lower Infrastructure Costs, and Enhance Organizational Communication.